His father was a good singer and his mother a very good pianist and as a family were involved musically with the Methodist church they attended in Cheadle Hulme. Mart took piano lessons at the age of five, with Madame Harrison, a formidable lady who would scream if he hit a wrong note. He reached a reasonable standard and still plays today from time to time when required. In the meantime, Donald had been to Canada to take his wings as a bomber pilot, where he heard the likes of Benny Goodman, Bob Crosby and his Bob Cats, Artie Shaw and Chicago Jazz. He brought home their records, which were to play a major part in influencing Mart, who still has all the records, including an Eddie Condon folder complete with pictures of the musicians plus material from Glenn Miller and vocalist Vaughan Munroe. However, 1944 saw Mart taken seriously ill with a lung infection and finding himself in the P.P.H. Manchester where the specialist Graham Bryce tried to cure the problem with the left lung. Mart didn’t respond and his father asked what were Mart’s chances if an operation were performed…a 20% chance was quoted…and Mart’s father said, “Go ahead!” Mart lives to tell the tale, but his left lung remains useless. Yet amazingly he passed A1 for the army at the age of 18. He declined to reveal information about his lung because he wanted to go in the army, and it obviously passed examination. Sadly his brother Donald was killed in action whilst Mart was in hospital. During his recuperation, the music his brother had brought home together with the Pee Wee Hunt’s celebrated 12th St. Rag continued to inspire him and he decided there and then that he wanted to be a jazz clarinettist. So, in the early 50’s, with his friend Peter Eccles, who was keen to play trumpet, Peter’s sister Kathleen and her boyfriend Bob he began going to concerts at the Holdsworth Hall in Manchester and listening to the likes of Mick Gill’s Imperial Jazz Band, Humphrey Lyttelton and Chris Barber, playing King Oliver style at that time, and the Yorkshire Jazz Band. He was of course still at school, Heaton Moor College, with now one of the best session men in the country, David Browning, as classmate. And it was here, in 1951, where he formed his first jazz band known as the Darktown Jazz band. It comprised of Alan Pendlebury (trombone), Geoff Sykes (banjo and guitar), Peter Eccles (trumpet), Geoff Wyche or David Browning (piano) and Alec Gordon (double bass) with himself on clarinet. They played at the local youth club dances in the interval. During this period, Forsyths on Deansgate was the venue for a 10-inch record being made, of Mart, Peter Eccles and the rhythm section playing Weary Blues and Chimes Blues. Then John Mayall came on the scene and joined the band on banjo and guitar, plus Nev Taylor, who had recently come out of the army, on drums. Johnny Tippett (banjo) and several others attached themselves in due course. There was no set line-up. Mart, now thoroughly hooked on jazz, used to nip down to Manchester on Sunday evenings, without his parents knowing, to visit the Clarendon Hotel, All Saints and listen to Alan Hare, playing trombone at that time, with the Blue Note Jazzmen. To his delight Alan let Mart sit in with the band. Then he was invited to join Stan Reed’s Mohawk Jazz Band, who played at the George and Dragon on Swan St. in Manchester, also known as The-Band-on-the-Wall. But because Mart was under-age and still at school, when police raided the joint Mart made a swift exit and escaped unnoticed, with his clarinet, by climbing out through a sash window at the back of the stage. It was a somewhat rough joint, which attracted some dubious clientele. During the school holidays Mart helped his father at their textile business based in Chorlton St. Manchester. One day taking a short cut through Lewis’ Arcade to the bank his father’s eyebrows were raised when, “Hello Mart!” emerged from two ladies of ill repute who frequented that well-known arcade. Mart’s secret escapes into the night were out, but Dad enjoyed re-telling the tale to his business colleagues and no harm was done. He then took up full-time work in the family business and some lunchtimes met up with a group of musicians, including Cephas Howard and Tom Alker, at the Art School and also at a café close to Albert Square where he snacked with singer Ted Calvert, and record collectors Bill Entwistle and Bill Brennan who suggested that Mart started a jazz band and call it the Jazz Aces. This was 1953 and Mart, Dizzy Burton (trumpet/cornet), brothers Alan (trombone) and Keith Pendlebury (piano), Bob Power (drums), Eric Batty (double bass) and Suzanne McManus (banjo and taught by Mart) evolved as the Mart Rodger Jazz Aces playing at the Vieux Carre Jazz Club in Urmston and then the Clarendon in All Saints. Call up papers arrived and Mart found himself based initially at Blackdown near Aldershot. He volunteered to join the Corps Dance Band…a fatal mistake! He tells me he suffered as he was kept there over Christmas and New Year to play in the band instead of going home on leave. However, a posting to Foston, near Derby, allowed him to hitch hike home at weekends to get his fix of jazz and see his sweetheart Janet, whom he’d met at primary school. He played in a duo with John Mayall at the Bodega and they called themselves The Dreamland Boys. A tape of them, with Alan Hare and Derek Atkins at the Kings Hall, Cheadle Hulme lurks somewhere. Tom Alker had replaced Mart with the renamed Eric Batty Jazz Aces and had married Suzanne McManus. They had become less experimental and more commercial at this time. With the army Mart then went to Tel el Kabir in the Middle East and his clarinet went too….charming snakes no doubt! He followed in the footsteps of Acker Bilk and started a jazz band, teaching everyone to play banjo, ukulele and whatever they could muster from the quartermaster’s stores. The band was aptly named The Canal Zone Stompers. Ray McNair ( banjo) was one of the band and he and Mart still keep in touch. Fortune shone on Mart and he became chief clerk to the G.O.C. As a result he saw important postings before anyone else did. He spotted an opening as a record librarian in the Forces Broadcasting Service, applied successfully and was moved to El Kantara becoming a military civilian attachment. Here he worked with some delightful broadcasters including Michael Danvers-Walker (son of Bob), Ron Kelly later LWT and many entertainers such as Harry Secombe. The bonus was that he had the pick of the records and so lots of serious jazz emerged over the airways. Listeners were educated in jazz and he featured in the gang show, playing his clarinet to a packed house every night. Evacuation of the Canal Zone in 1956 was time to pack up all the records. He moved to Cyprus and finished off his two- year stint, applied for a local release and hitch hiked home from Nicosia. Now it was back to the family business and time to form a new band, The Hounds of Sound, with John Mayall (piano), Janet Bazley (banjo), Ron Barker (trumpet), Alan Hare (trombone) and Pete Ward (drums). September of the same year found Mart moving to join the Zenith Six. John Barnes had departed to London to play with Mike Daniels, Liverpudlian Bob Wright had stepped in for a short time, then Mart got the call to replace Bob joining Tony Charlesworth (trumpet), Tom Gregory (double bass), Ronnie Arnold (drums), “cousins” Malcolm (trombone) and Derek (banjo) Gracie, but one was actually uncle to the other, and Sheila Poyser (vocals). Friday nights at the Clarendon had begun, with George, the waiter defying gravity and exhibiting tremendous strength with his ability to carry pint upon pint to dizzy heights to the upstairs room, which was ideal for jazz, it could have come straight from New Orleans. There was never any particular leader in the band and they operated as a co-operative. Malcolm moved on to Guildford to train as a solicitor and various deps took over. They were a much-travelled group and were commissioned by Jazzology to do a two LP tribute to Jelly Roll Morton, which was unusual as there wasn’t a piano in the group. They recorded at the Capitol in Didsbury for ABC Television and played regularly at the Cavern in Liverpool, where the Beatles were at one time the interval spot. The band set high standards and the Queens, Southport, the Bamboo Club, Hazel Grove together with Coventry and London tours were on their agenda. At this point Alan Pendlebury wanted to turn professional, so Mart decided to leave as did Derek Newton, Denis Gilmore and Nicky Holcroft the drummer, who went on to become a comedian, winning the first “New Faces” TV programme as Nicky Martyn, and now works on all the top cruise liners. Mart played for a while in the Ged Hone Ragtime Band, with Eric Brierley and was with them for between eighteen months to two years. Then Ged decided to adopt a new musical policy, so technically they were all fired. Mart started “Mart Rodger’s Jazzers” and also played in the “Jazz Cardinals” plus a number of other bands. Mike Pembroke and Bill Smith contacted Mart as they were starting a new band which was called, in turn, for tax purposes, the Mike Pembroke band / Mike Pembroke’s Hot Seven / Mike Martin’s Band / Mart Rodger’s Hot Seven /Big Pete’s Lecherous Seven and The Alley Orchestra. Humphrey Lyttelton came to play on several occasions and a Jazz Club broadcast was done from the Playhouse Theatre in Manchester. It was“spot on” for a live broadcast and one of the best Mart has ever been involved in. This band started Mart’s close friendship with Pete Staples. Some superb sessions at The 100 Club followed and recording was made for the Jazzology label entitled “Chicago Buzz”. Earlier to the “Zenith Six plays Jelly Roll Morton” LP, Mart had recorded for Jazzology with a pick-up band of Manchester musicians. This LP was entitled “Feelin’ The Spirit” and the band was called The Canal Street Ragtimers. The line up was: Trumpets, Tony Smith and Roy Bower; Trombone, Chris Brown; Piano, John Featherstone; Banjo, Derek Gracie; Bass, Colin Knight with Mo Green and Derek Hamer on drums and Mart on clarinet. George Buck has reissued this on CD. The next LP Mart was involved in for George was a recording entitled “City of a Million Dreams” which featured a number of bands. These are: George Lewis/Kid Thomas Ragtime Stompers, Mart Rodger’s Clarendon Rhythm, Sayles Silverleaf Ragtimers, Kid Martyn New Orleans Ragtime Band, The Zenith Six and The Lakefront Loungers. 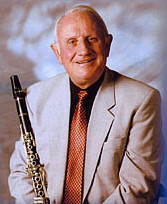 George Buck has referred to Mart on several occasions as the best clarinet player he has heard. Mike Pembroke announced that he had decided to pack-in playing and the band was disbanded. So Mart took on the task of running the youth club at church, his two sons being of formative years by now, and the handful of children became what seemed like thousands. However, jazz never took a back seat, the running of the youth club was passed to other parents, and Mart joined Ged Hone playing weekly in Marple Bridge with the Deep Sea Jazz Band, named after the local first class fish and chip shop. Here jazz was pure enjoyment. There were no responsibilities. Rod Hopton played trombone with Jimmy Flynn (drums), Reg Kenworthy (double bass), Steve Buckley / Frank Mayer (guitar), Eric Brierley (trombone) and Ed Fish followed by Roger Browne on piano. Janet and Mart decided to go to the States for a holiday, staying with John Mayall in Los Angeles and driving many miles ‘doing the loop’ of California, Los Angeles, Death Valley, Yosemite National Park, Sonoma, San Francisco, Monterey/Carmel and back to Los Angeles. While in Santa Monica, they were out for a Sunday afternoon walk and heard some wonderful sounds coming from a club called Sterlings. Inside, they found that the man playing the sax was Rosie McHargue, clarinet player on Pee Wee Hunt’s famous 12th. St. Rag. When the pianist heard that Mart had recorded for Jazzology she asked him to go and get his horn. He then had the opportunity to sit alongside Rosie McHargue all evening making music with him. Rosie had played in Pete Dailey’s Chicagoans and led his own band. It was 1984. Mart mentioned to Rosie that as his business was very demanding he was talking of packing jazz in. Rosie said,” If you gave up playing jazz what would you do?” Mart had no answer. Rosie said,” Forget it then!” and for that advice Mart will be eternally grateful, as will we all! Mart and Janet then flew on to New Orleans where Mart asked a musician, whose band was playing in a club on Bourbon Street, where he could get a sit-in. The musician said,”Where are you from?” Mart said, “The north of England-Manchester.” He musician said, “Say, ever heard of the Canal Street Ragtimers?” Mart said he was the clarinet player and he was allowed to sit in with that band. He was heard by Lou Sino who told him to stay on, as he wanted him to sit in with his band too. (Lou Sino and the Bengals). Reading the “American Rag” one day, Mart noticed that Rosie McHargue’s friends were to celebrate his 95th birthday with a party in Fullerton, California. It was April 1997. They decided to attend and Mart was able to sit in at the jam session at the end. Rosie and his musicians played all afternoon and it was wonderful. The next year they went to his 96th party and this time Mart was given a half-hour spot to himself, with an American rhythm section. They should have gone to his 97th party, where Mart would have done a spot again, but Rosie was unwell and they kept the party to a very low-key affair. Rosie died soon after that. Returning home, Janet suggested the new band Mart was considering forming be called Mart Rodger Manchester Jazz. His friendship with Pete Staples had flourished and Pete had become a sales director with Mart’s family business. They got going. Allan Dent was called to play trumpet and they advertised for new members. It was October 1984 and Mart had Pete Staples (drums), Allan Dent (trumpet), Eric Brierley (trombone), Bob Ascough (banjo), Colin Smith (double bass) with Joe Palin, Alan Hare, Alec Collins and Roger Browne as pianists through the years. Twelve years later Terry Brunt took over as trombonist and Charlie Bentley as banjoist. Don Long lasted a year on trombone and Eric Brierley is now back. Nigel Cretney has replaced Pete on drums. A highlight has been the times the band has shared with the late Marion Montgomery. She did eleven or twelve separate concerts with the band and was on their third cruise. She delighted in singing and recording with them and the band were proud to be asked to play at her funeral. Humphrey Lyttelton is also a good friend of Mart and the band. He has played with Mart many times over the years - in fact, on the weekend of Humph’s 50th birthday they played together in Poynton, Cheshire, and on the weekend of Humph’s 70th birthday they had a gig at another venue in Poynton. Humph was compere on one of the several BBC broadcasts recorded some years ago. Mart Rodger Manchester Jazz are very much in demand all over the country as well as abroad. In August 2004 they played in Stavanger for the Tall Ships’ Race and will return to Norway in January for their 30th trip to that country. Next May they are booked to appear at the Dresden International Dixieland Festival for the third time. Mart feels privileged that he is surrounded by six fine musicians and together with Janet, Mart’s wife, who has supported Mart’s career throughout, is a formidable and respected team. Janet writes and produces a regular, informative well-written news letter and is on hand to sell C.D’s / tapes at all their gigs. Now Mart is thoroughly enjoying employing his very real gift as a musician and his ambition is to use his talents to benefit less fortunate people: eg. Those at The Francis Hospice for Children in Didsbury and The East Cheshire Hospice. He has created a routine of playing in village halls where a donation is made for these charities. Over £1000 has been given to St Luke’s Hospice in Winsford. Various amounts have also gone to the East Cheshire Hospice and to Ashgate Hospice and Friends of Bakewell Hospital. This money is made up from a contribution from each ticket sold, plus the money raised in the raffle. Although jazz virtually fills his life, he does have time to play golf. He has played since he was 13. His handicap is 14, though he did play off 8. And this is a hobby he shares with his wife Janet. Maintaining their garden is also high on the agenda with a beautiful show of Spring flowers leading to colourful displays in Summer and those famous Rodger Runner Beans are a sought after raffle prize at the Monday night jazz gig. Mart Rodger Manchester Jazz/ is a fine band. Look out for them at festivals throughout the country and at their weekly Monday residency, Didsbury Cricket Club, which has been going for twenty years. Their session, which is held at Poynton British Legion Club on the third Thursday of each month, has been going for more than two years, and is well attended with a regular audience.